Nowadays, AC motors are the most important workhorses in industry and commercial facilities. An AC motor is commonly used as a constant-speed drive when fed from a voltage source of fixed frequency. Unfortunately, running an ac motor at maximum speed, regardless of the varying demands of production, means a great deal of electric energy is wasted. In many motor applications, energy use can be decreased considerably if the speed of the motor varies in response to the changing process conditions. With the advent of solid state electronics, AC variable frequency drive (in short VFD, or AC drive) can regulate the speed of a three-phase AC motor by converting three-phase AC line voltage to a quasi-sinusoidal pulse width modulated (PWM) waveform in which the frequency and voltage level can be varied. Because of the benefits mentioned above, AC drives are becoming prevalent in a wide range of applications throughout industry: from motion control applications to ventilation systems, from waste water processing facilities to machining areas, and many others. For example, AC drives are used in ventilation systems for large buildings where air flow requirements change according to the humidity and temperature in the room. Fan speeds in power plants are adjusted according to the varying demands for power at different times of the day, week, or year. However, the increased use of AC drives presents the maintenance and troubleshooting service community with both the opportunity and challenge of learning to maintain, troubleshoot, and operate this equipment. Technicians consistently face the challenge of getting accurate voltage, current, and frequency measurements that match what is shown on the AC drive's control panel display. It's always better to understand the basic operation of an AC drive before proceeding with troubleshooting and maintenance. As shown in Figure 1, an AC drive consists of three sections: rectifier, DC link or DC bus, and inverter. The three-phase incoming AC power is rectified to a rippling DC voltage. The rectifier is made up of a group of gated diodes (silicon rectifiers or SCRs). 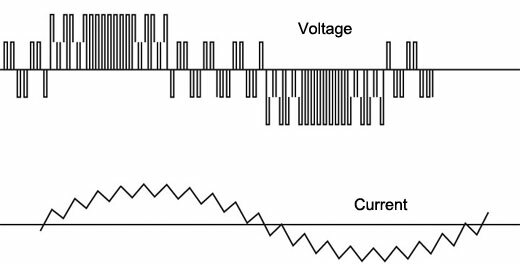 This AC-to-DC conversion is necessary in order for the power to be shaped into a variable frequency signal. The DC link connects the rectifier to the inverter, and smooths and holds the DC voltage at a constant level for the inverter. There are two major components to the DC link section: capacitors and coils. Extra care should be taken when dealing with AC drives as the DC link can produce up to 620 VDC at 750 A. In the inverter, AC drives use insulated-gate bipolar transistors (IGBT) to vary output frequency to the U, V, and W terminals of the motor. (Refer to Figure 2 for AC drive output voltage and current.) Using PWM, the speed of the motor and torque characteristics can be adjusted to match the load requirements. In the manufacturing plant, when an AC drive failures, production often grinds to a halt. Facility workers are then under pressure to troubleshoot it to get it back online. In order to prevent downtime and keep the AC drive running, periodically measuring the AC drive's input and output allows proactive corrective action to be taken as needed. When dealing with modulated PWM output, using a conventional digital multimeter makes it difficult to obtain accurate frequency and voltage measurements. Typically the readings obtained will be around 20 to 30% higher than the actual output shown on the AC drives display. Basically, an electrical filter is a circuit that can be designed to modify, reshape, or reject all unwanted frequencies of an electrical signal and pass on only the desired signals. Low-pass filters allow only low frequency signals to pass unaltered while attenuating all other signals that are not wanted. A simple passive low pass filter (LPF), can be easily made by serially connecting a single resistor with a single capacitor (Figure 3). Safety precaution: When maintaining and troubleshooting mains power or other high voltages, safety is very important. Do not compromise personal safety for any reason. For your own safety and the safety of those near you, you must choose a handheld multimeter that is designed and tested to protect you against the electrical hazards you might encounter. When troubleshooting a VFD in operation, choose a CAT III 1000 V or CAT IV 600 V-rated handheld multimeter. Adhere to all safety procedures while taking these measurements. For more information on selecting a handheld multimeter that is safe for your application, read the application note, Think Safety When Selecting a Handheld Multimeter. The unexpected breakdown of rotating machinery is the single biggest cause of emergency downtime in all types of businesses and facilities. Once an AC drive has been installed, regular maintenance should be carried out periodically to avoid premature failure of the motor VFD. Early detection of machinery failures relies on the accuracy of the measurements obtained using a handheld multimeter. Troubleshooting AC drives also requires accurate information. The handheld multimeter provide accuracy and offer the low pass filter feature which expedites the troubleshooting of AC drives to restore equipment to optimum operating efficiency.